In this post, not only will you learn how to create essential brand graphics, but you will get key tips on how to implement them, the elements they should include to be effective, and the best places to get free and paid resources to enhance your visual strategy. It allows your readers to experience your history, your values and your work through their senses and emotions rather than only through a description. Your brand’s “visual voice” are all the visual elements you develop that consistently communicate your message, brand and personality. Building your brand identity is much more than just adding a few pretty pictures to your blog posts and Facebook updates. It’s everything you do visually to make an impression or impact (intentionally or otherwise), and contributes significantly to how you are defined as an author. Every time someone sees a piece of visual content from you – your logo, your book cover, an image quote, a short video – it adds another layer to your brand story. 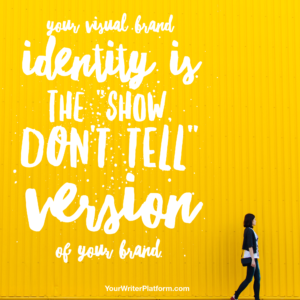 If there is a disconnect between what you convey visually and the true essence of your author brand, it will confuse, disappoint and possibly even alienate your readers. 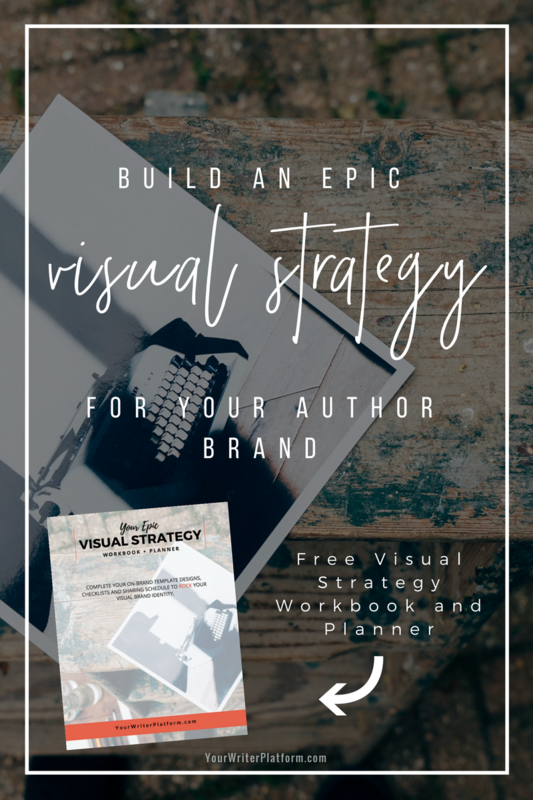 Designing a visual strategy for your author brand doesn’t have to be overly complicated to be effective – but it does require some forethought and planning. 12 main types of visual content that you can incorporate into your visual strategy. How to tailor what you share to build momentum and interest. What you need to have in place before you start developing your visuals. How to create your essential brand graphics (and the tools that make it easy). How to set up a manageable social sharing schedule. Want to get the workbook and planner that will help you implement the strategies discussed in this post? Click the image or the button below to grab it. Screenshots – these are images you take of all (or a portion) of your computer screen, that can be particularly helpful in showing a process or an “over-your-shoulder” view. (For Mac users, use shift+command+3 for full screen screenshots, and shift+command+4 to highlight and screenshot a specific portion of your screen). Infographics – infographics help you compile and share more complex information visually and “at-a-glance”. PDF how-tos, checklists or tutorials – you can easily create PDF checklists, workbooks and so on, to further your reader’s learning or to add even more value to your content. I use a combo of Canva (for the cover page design) and Pages for Mac to create all my checklists, workbooks and guides. Cartoons – depending on your brand personality and topic, cartoons can be an excellent way to simplify and exaggerate the concepts or ideas you wish to share with your readers. Blog post graphics – your blog post image directly affects shares and traffic and is second only to a fantastic headline. The featured image appears at the top of your post and in social streams when the post gets shared – so it needs to make an impact. Slide decks – whether you’re speaking at events, teaching an offline workshop, or delivering a webinar to a captive audience, your slide deck is another tool in your visual arsenal. To save on time, it’s tempting to just create one visual (like a blog post image) and throw it up on all your social media platforms. And although a visual is better than no visual, you’ll get much more engagement and attention if you take a little extra time to tailor your visuals and content to capitalize on the different strengths of each channel. Each social media platform has a unique vibe, as well as different preferred image dimensions for its posts, so don’t use the same messaging on every platform. …it’s important to figure out how to natively tell stories on each platform and which visuals and copy will enhance the likelihood of a given post’s going viral. Twitter is great for quote and blog post graphics, Facebook works for all types of visuals (including video), and Instagram is your go-to platform for beautiful photography, stylized shots and quick, casual videos. 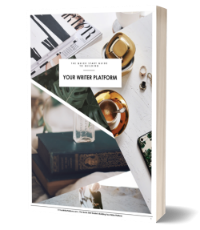 To build momentum and interest, skip the “one graphic, multi-platform approach”, and develop a content focus for each platform that shares a snippet of your personal brand, as well as compliments your overall book marketing strategy. To ease the time demands, batch the creation of your visuals, and design multiple images promoting the same article or link (from different angles or perspectives), all in one go. This is the heart and soul of your brand. Your core beliefs. It’s your worldview and the values that inform every aspect of your brand and your work – and the vision you have for your writing that you will never compromise on. What are the main goals, themes or intentions of your author brand? These are the people you wish to experience your work, and will benefit most from doing so. They are the people that encourage you to keep at it, inspire you to reach and grow, and will generously help bring more cohorts into the fold. Who are your ideal readers? What identifies them as being a great fit for your “tribe”? This is the experience you create for your readers; your difference (or your own special sauce) and the benefit you bring to your readers. It’s also how you translate or articulate your uniqueness into a brand identity that only the “right” people connect with, plus any and all mediums you use to do it. What is the desired impact you wish to make, and how does that look in terms of branding, content and marketing strategy? With all you have to do, it’s easy to get bogged down in the minutia. So don’t overcomplicate the process by having to start from scratch each time. Instead, stay sane by creating standard templates for each form of visual you will be sharing (featured blog post images, image quotes, video thumbnails, etc. ), and for each social media platform. This will simplify your workload, as well as keep your branding consistent. Canva.com has ready-made templates and up-to-date social media image sizes to make things super easy. Or, you can use Photoshop or PicMonkey and check photo and image sizes for the major platforms here. Make sure to include a watermark or overlay with your logo, URL or other consistent brand elements to make your graphics easily recognizable. You can also design multiple variations of your update to help increase the reach. Photos – your own, free or paid. (Get free, high-resolution photos at Unsplash, or Pexels.com. All of the images are licensed under creative commons). Flaticon.com – a huge searchable database for icons available in several formats. Screencast-o-matic or Jing – use to create and share screen recordings. Quicktime Player (Mac) + iMovie for editing – this is what I use for both screen recordings and other video recordings. WeDistill.io offers stunning HD footage for your videos, as does Pexels Videos. Check out the YouTube Audio Library to add soundtracks to your videos. Find free fonts from fontsquirrel.com. Mockups – try placeit.net or smartmockups.com. Myecovermaker.com – a 3d cover maker. Visme – allows you to create both presentations and infographics while allowing you to add full interactivity to any object. You can share, embed or even download your project for offline use. Piktochart or Infogr.am – great tools for creating infographics and charts. Buffer.com, Hootsuite.com or Edgar – to schedule your social media posts to publish automatically. The final step is to schedule the visual content you’ll be sharing. Create a social media editorial calendar to help stay focused and efficient, and begin incorporating your new visual content into other content you already share. Plan to stagger the content type (photo, graphic, video, image quote, or other), as well as the content focus (behind the scenes, book or motivational quotes, launch info, cover reveals, etc. ), for both visual appeal and reader interest. Blog post featured image + graphics. Other people’s posts and interesting links (with post image or graphic). Image quotes and sayings – quote from your book, industry influencer quote, inspiration, etc. 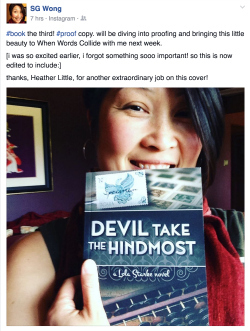 Cover previews or reveals – sneak peek of a portion of your upcoming book cover. Workspace photos – let your fans see where the magic happens. Reviews and buzz – share these visually with a colour, texture or photo background. Promotional – discounts, free days, new release info or previews. Event schedule – share with a collage image of event venues or an image of your handwritten itinerary. Pinterest boards and inspiration – share your boards, or other boards/pins that inspire you or relate to your genre or topic. Progress updates – design a progress bar, share a photo of your document word count, or a pic of your aggressively edited manuscript. Share or re-share fan photos and art (again be sure you have their consent). Highlight and support other authors – use their visuals when recommending them to your audience or create specific graphics that highlight each author’s brand, for cross-promotions or other collaborations. 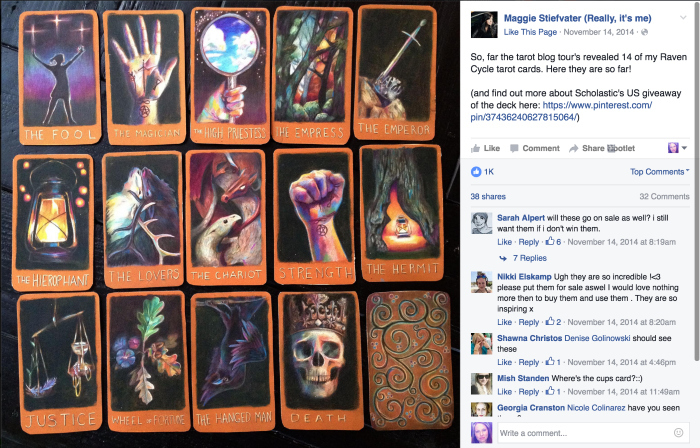 Show physical items from scenes or characters in books (see Maggie Stiefvater’s tarot cards). Design on-brand visuals for games (quote fill-in-the-blanks, trivia, scavenger hunts, mad-libs, guessing games), playlists, or Q&A sessions to make these activities instantly recognizable in your feed. Personal life – share you in RL (real life). This may seem like a big undertaking, but if your work really does matter (and it does! ), it’s critical that you start implementing a visual strategy for your author brand. And while what you write is important, your biggest hurdle is ensuring that the people who should experience your work, have the opportunity to do so. …the intention and energy we put into our marketing is a clear reflection of how much we believe in what we’re doing. You now have the specific steps to intelligently (and intentionally) support your book marketing and branding efforts with visuals. Any questions? How do you plan to incorporate visuals into your branding and social sharing efforts? Share your thoughts or stumbling blocks in the comments below. I think it is very important to create a visual strategy! Some of my friends will absolutely love this! Building a platform is so important, yet so many artists forget to do this (or wait until a long time after their book is released) and don’t realize the value of having a place to share your work! Hi, Thanks for all this great info! 🙂 I have a question about author websites (with a domain in the author’s name) versus having a book landing page on a site that is the author’s site but is not in the author’s name. In preparing to launch my book, I could keep using my travel site which is called Paradise of Exiles, and I could add a book landing page on that site. Whether you use your own name as your domain name is a matter of preference, branding and and a little SEO. Often it’s best to use your own name when developing an author brand, as it is the one constant in your writing business. Your genre or topic area may change, there will likely be more than one book to promote, but creating an “umbrella” brand based around you, is usually the simplest and best strategy. That said, it’s not critical. You can create and share book landing pages from an already established site – assuming the book(s) share the same or a very similar target audience. If you are going to have an internal book landing page, make sure it is a dedicated, distraction free page that allows for easy social sharing. For your launch, make sure you direct people straight to your book landing page (not your website homepage), and promote that URL in all your marketing collateral. Best of luck on your launch Chandi! What an excellent and well-thought out strategy/guide!